QQs are for anyone, anywhere, anytime. Qustom Quinns are made-to-order sneakers designed especially for you. 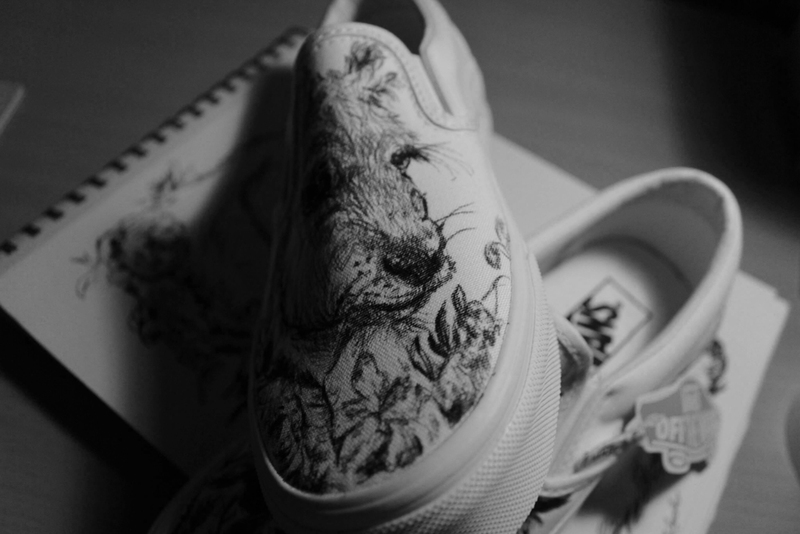 Quinn uses an ink pen to draw your desired design on a pair of light-colored canvas kicks. You can order a pair of sneakers through this website or ship your favorites to Quinn, who will then give your shoes the makeover of a lifetime. Can I wear qustom items in the rain? Qustom items are created with water-resistant materials and sprayed with a protective coating. They can be worn in light rain. The artist is not responsible for any damage to your items once they are in your possession. Where do I ship my shoes/hat so Quinn can draw on them? Please e-mail DrawingsbyQuinn@gmail.com to request the address. A QT, also known as a Qustom Tote, is a cotton tote with a hand-drawn design by Quinn.